Six months after first starting this blog in 2005 I came across another form of online communication called a “Podcast”. Initially, like blogging, I had no idea what this term meant, but with some quick research I learned that podcasts and podcasting are all about creating audio files and syndicating them online via things like RSS. You can read my more lengthy definition of what a Podcast is here. Blogs, which come with RSS, seemed like a good fit for a podcast. I didn’t see the need to create a completely new entity for my first podcast, I figured I’d just experiment and distribute the podcasts on my blog. The first few episodes of my podcast featured basically my voice rambling about a topic. It was at this point that I discovered I was actually quite good at talking off the top of my head about subjects I had something to say about, and could easily fill a 30 minute audio with reasonably coherent content. However it was when I began to invite other people on to my podcast and ask them questions and have a discussion that I really started to see the compulsion to podcast on a regular basis. 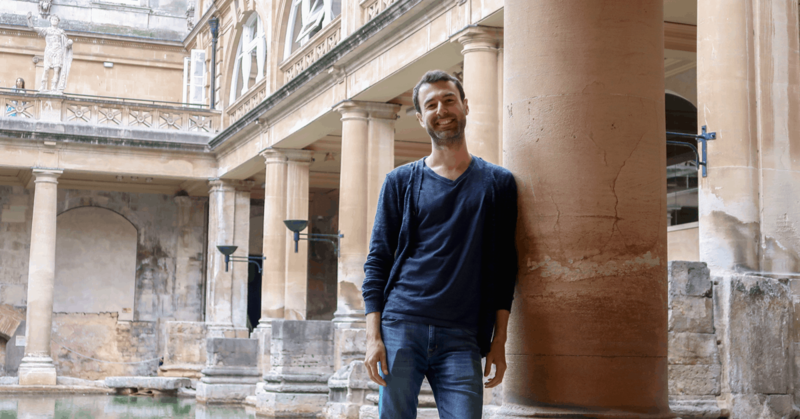 Not only could I create good content for my blog, which would syndicate all over the web, I also enjoyed the opportunity to meet, talk to and learn from people who had achieved things and had interesting stories to tell. Many of the first podcast interviews led to introductions to some of the most effective joint ventures I’ve ever done. Podcasting also helped to spike traffic to my blog, especially when the person I interviewed linked through to the interview I published with them, not to forget all the other blogs who link through as a run-on effect. To keep this straight to the point, I’m going to outline what I consider the most important elements to ensure you create a quality podcast interview. Here they are in no particular order. The majority of the podcasts I’ve done in recent years were recorded using just Skype and a program called “Call Recorder“, which is Mac software that allows you to record audio and video conversations over Skype. PC users can try Pamela to record Skype calls. Not every podcast I have done is perfect. Sometimes lines drop out, volume isn’t balanced, video is blurry (for video interviews) or there is lag, but on the whole, just using simple tools results in a high quality output. On the rare occasion I have to open up Garage Band, which comes with Mac, or you can try Audacity for PC, and edit out silence from lag, or increase volume, or link together multiple audio files if the call dropped during the recording. Taking a little time to edit any major issues is worth it, just don’t go crazy or you may never get your podcast out the door. I previously used bells and whistles like theme music, introductions and outros, but in the end I decided that simply getting the audio out there in a clear, simple and straight to the point recording satisfies people. The content is what matters, so you only need ensure your technology creates something that people can understand and requires minimal fuss to manage at your end. During the interviews I’ve done, the only prolonged talking I do comes in two stages – a brief introduction of who I am interviewing at the start, and sometimes a recap and simplification of a point made during the call by the person I interviewed, if I believe the point is important or needs clarification (often I do this for my own benefit too to make sure I understand what is being said). The rest of the call should be all about the person you are interviewing. They do the talking and your audience is there to learn from them. You are simply a facilitator, who is there to extract the best information you can with the right questions and responses. I NEVER prepare questions in advance for interviews. I rely on a genuine interest to learn something, and – this is important – extract the story behind the person being interviewed. I focus a lot on the personal history, the anecdotes and time-line that led to the person becoming who they are. In fact in almost every interview I’ve done, a good chunk of the early part of the call is all about diving into a play-by-play recount of who the person is, where they were born, what did they study, how did they get into what they are doing today, etc. If you need prepared questions to help prompt you, that’s fine, and I definitely recommend this if you haven’t developed the skill of thinking off the top of your head and feeding off responses from other people. Being able to guide a conversation to the most important elements is critical, so this will take practice, however if you really do care about learning from this person, you can treat the interview like a conversation you might have sitting with them face to face at a cafe. Every person is different, hence every interview is different. Some people like to talk. Some people are shy and some are simply not the best speakers, yet if you dig around they have a great story to tell. The easiest interviews I’ve done are by people who have interesting personalities, are good story tellers, but are not overly prepared for the interview. There’s nothing worse than an interview that is devoid of emotion because the person has told the exact same story over and over again as if reading from a script. You won’t really know what type of person you are about to interview until you speak to them, which doesn’t give you time to prepare – you have to deal with whatever mood and style you are dealing with. I’ve done interviews with people who clearly started off not in the best mood to talk. Although tough at first, my secret has relied on one thing to get people talking – ask personal questions. Everyone’s favorite subject is themselves, and while it may not work immediately, in every situation I’ve been in during an interview, once I hit the nerve regarding an aspect of their life or personality they are proud of, or are passionate about, they will open up and start telling great stories. Sometimes it takes some probing, but if you keep asking things like “how did you do that?” or “where did you learn to do that?” or “how did it feel when you did this?”, you will eventually warm them up enough to start giving you their best stuff, provided you come across as genuinely interested. This is absolutely critical. When interviewing an expert, and you want to produce an interview that really teaches unique insights into the subject the expert knows about, you need to enter the mindset of your audience. This is a lot like becoming your customer when defining your niche. If you have a clear understanding of the problems, language style and background of the person listening to the interview, then you will have a clear picture regarding what questions to ask. This is particularly important when dealing with beginners because you often need to ask the person you are interviewing to clarify how to do things down to a granular level, as they will otherwise gloss over the details. When in doubt, ask the expert to break it down into step-by-step procedures. The best interviews I have done have been very specific as teaching tools regarding how to do something. Often the best stories come from really tangible case studies, where all I need to do as an interviewer is ask the person to explain how she or he did what they are famous for doing. If you combine a great case study, told as a story, with lots of tangible, real-world examples, presented as steps your audience can replicate, then you have the ingredients for a truly awesome interview. One podcast should not go longer than an hour. Forty-five minutes is a good time-frame to aim for, but don’t be afraid to end a call at 25-45 minutes if you’ve covered the topic enough. If a call is going long, but the quality is high, you can break up the interview into parts. This can work well for the particularly long case studies, which require detailed breakdowns, and you end up with two really good podcasts. 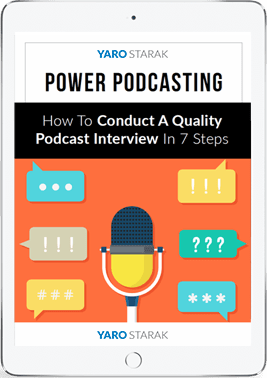 There’s more I could talk about regarding how to create quality podcasts, but at least now you have a solid list of some of the most important elements to make an interview work. Practice really does make perfect in this case, because the more relaxed you are, the better your interviews. Keep a good flow, make jokes now and then, and refocus the interview when you feel it’s moving off track, and in the end you will have a quality podcast interview. I have always found your podcast interviews to be a cut above the vast majority of those conducted by other bloggers, so these tips are definitely coming from a credible source. Two interviews that stick out in my mind are those you did with Pat Flynn and Laura Roeder. Well worth the listen. I agree that Yaro is a master at creating podcasts. So these tips are definitely good ones. You can never overestimate the importance of what quality audio. So be sure to use good recording software and ensure that there are minimal background noises. Nothing kills a good podcast more than poor audio filled with static. It may annoy people too much for them to bother listening to the entire podcast. Glad you enjoyed my podcast Mike, Yaro is indeed an excellent interviewer! usually, we don’t see those important factors behind your interviews!!! Everyone will say this, but another good post Yaro! What is your technique to getting the interviews, how do you go about trying to contact people? I am sure it is a lot easier to get in touch now, but how did you get started early on? Nothing too clever – I just send out an email and ask. Not everyone says yes of course, but some do! All you have to do is be specific about what topics you wish to cover and where the interview is going to be published when you make your interview request. I really like podcasting. Yaro, Thanks for the article (and for answering my Tweet!) Downloaded SKYPE and played with Pamela this past weekend. Armed with these tips I am ready to rock! Could you do a follow up article on how and where to post the podcasts? I fired up an old iBook as I was looking for a low cost solution for phone interviewing. Ended up with Hijack Pro, Skype, Audacity, an iMic and an old Logitec microphone I had laying around. In the course of my “research” I stumbled onto Levelator software and am giving it a test run. Now with this post, I have everything I need. Just mix the ingredients and add guests! Thanks, Yaro. Yaro, great info on podcasts much appreciated. Podcasts are something I definitely want to do more of. Thank you very much for this. I have listened to the majority of your podcasts and just enjoy how you keep in control of the discussion yet extracting invaluable information for your listeners. I hope you have one latest one on the way soon, i always look out for those! Thanks Yaro – lots of podcasts out there that are almost “unlistenable” so thanks for putting a few points down. We’ve found in our tests that actually anything longer than 30 minutes and listeners start to fall off dramatically. I have yet to do my first Podcast but it is definitely something I want to explore in the days to come. I will be embarking on my 1st six months mark around the end of the month and there are some attributes that I want to have in place on my blog and podcasts, personal written eBooks, and my own products are things that I want to have in place. Thanks for sharing such great tips Yaro, this really inspires me!! Talking about podcast it is a great dismay to us knowing that Adam Carolla rant against Pacquiao and the whole Philippines. Staying on the topic, I may add that please be responsible in making a podcast interview. This post is what I have been waiting! Since this year I’ve been really planning to do podcasting because of how I’ve seen you done them and I think you’re right that its a perfect way to do interviews. I have another question though, do I need to have a top-notch microphone to sound superb? I mean or does the standard headset with microphone wll work? Thanks Yaro! Got some technical tips here. I enjoy podcasting and interviewing authors in my niches. Authors just love to be interviewed. I know I do. Once you have a solid website in your niche, just look for authors of printed books on the topic that you can interview. Either buy the book or ask for a review copy, read it, formulate some questions you want more info on, and then get them on the phone (via Skype call out) if you have to, so you can easily record as Yaro suggests using software. Thanks, dude, I have always been interested in podcasts. I used to be a DJ so I have thought it would be cool to have my own podcast on any subject, whether IM or whatever. I’d want it to sound almost like a real radio show. I don’t even have an IM site up yet, but hope to soon. But anyway, thanks for the tips. If you’re serious about podcasting as a communications medium then I’m recommend shelling out on a decent microphone. Personally I use an Audio Technica AT2020 USB Condenser Microphone. Another tip I’d like to add is to record you and the interviewee on separate tracks. This is really easy to do with Audacity. Then, if you have problems with one of the tracks it’s much easier to edit. For example, when I interviewed Yaro I used some software called HotRecorder with Skype, however, I had a bit of a nightmare – due to the call dropping on and off a couple of times this caused HotRecorder to blend some of the recordings, meaning that for part of the recording Yaro and I were talking together. This would have been fixable had I recorded both our voices on separate tracks. Another benefit of recording on 2 separate tracks is if one of the people talking is too quiet, you can easily turn up the volume of that one speaker. I think the only criticism that I might have of some of Yaro’s previous podcasts is that the sound sometimes hasn’t been ‘equalised’, making it a little difficult to listen to on the go when one speaker is much louder than the other one. That said, I’m sometimes guilty of not getting enough done because I’m too much of a perfectionist! We dedicate a laptop just to skype when we do interviews. Yes, this is a problem that I notice many podcasters not addressing. When one person has a softer voice, you have to increase the volume on your listening device and then when the other louder person comes on, it booms up and is an irritation. Instead, just be quiet. Don’t say a word. Before you turn on the recording tool, let your guest know that you’re listening to every word they’re saying. When there is dead air, don’t fill it with a verbal affirmation. Instead, count to 3 and if your guest hasn’t started talking again, move on to your next question. Fill the dead air with silence instead of verbal clutter. t’s easier to edit dead air out of your podcast than it is to edit verbal affirmations. Listening with sincerity is very important. If there are hints that your interviewee wants to say something but can’t say it, then encouraging him to do so would open another area of his wisdom. I’ve never done a Podcast and maybe I should because I love to talk and if I can bring up good points about topics I’m truly interested using a Podcast without going too long winded then maybe there’s something there. Good article. I really like how you broke down certain key elements in what’s important to do. We interviewed a color expert, she was great. In the next couple weeks we will be interviewing a gardening expert. Thanks for the info to help us refine our interview skills. Thank you for sharing this information, Yaro! Its very helpful and inspiring. I would like to know how you integrate the podcasts in the blog and how them with the nice player you have displayed. And where the mp3s are uploaded to? Good tip Yaro. May I add that the ambiance or background where the recording is done should not distract the podcasting being done. This way, it will be much clearer and much nicer to listen to. I liked what you said about practice. Like everything, this too has a learning curve. It really is about just getting out there and making a start. We can spend too much time intellectualising these things and not actually doing the thing…. Nice article, Yaro, and with some good tips. Looking forward to make my first podcast for my photography website. You have done sixty of them! I am zapped. Thanks for a very enlightening post. I didn’t even know what podcasting was, a while ago. 🙂 Now I’m subscribed to a variety of them. You bring up some great pointers, some which I myself have observed and noted while listening. I particularly agree with point number 5. Many don’t realize how important it is to stay relevant to their audience. I like podcasts and really enjoy listening to them as well! They definitely make things more interesting. Podcasts might be a good way to freshen things up. I haven’t seen ALL of your podcasts, but am looking forward to catching up over my spring break. Liked to read it. But somehow I am still scared to do a podcast. Yaro, unlike I will prepare questions for interviews because sometimes I found it hard to create questions out of thin air and it doesn’t mean I don’t have any interest about that person Just because I think it is more secure to do it like that. I ahve listened to several of your podcasts, Yaro, and you definitely have the technique down right. You know how to engage your guest, as well as your audience. Speaking comes naturally for some, while others need to practice. I have also found that many people love to talk about themselves, especially if they have a new product launch. You know I have never tried Podcasting before. I have actually tried to perform a few video interviews as I believe being able to see the person brings a more “human” feel. Unfortunately I have not had too much of a response in people accepting my proposals. If you know it’ll work, do it and ask for forgiveness later! Well, I just started a blog and planning to take interviews of some famous bloggers and digg and SU power users. I’ll get a lot of help from this article. thanks Yaro. smile always could ease your day..
Let your interviewer know that you will provide time warnings and involve, use statements like one more question or “let’s wrap this up, can you quickly tell me” to cue your guest that time is almost up. I still think a longer interview with more quality information is better than a short one and like Yaro suggests, make it a two or three part series. Just as I was coming to grips with writing unique, quality content….you sure know how to move the goalposts, Yaro. The art of interviewing people is a different skillset altogether, especially as you can not sit and edit the final conversation the way you would have if it was a regular interview. I’d place this in the skillset of the more advanced blogger, for sure. This is a quality post on Podcast interviews, I’ve done a few with clients and have been very impressed with the effectiveness of them. I think it works often times better than video conferencing on skype! Yaro, thanks for the great podcast info. As always, I found your information to be very useful…especially the details about how to go about questioning the person you are interviewing. A close friend of mine recently started on her “podcast journey”, and I must say she is doing a great job. When she first expressed interest in including interviews within her information site I pointed her to this particular post, which she has followed. The main points of her podcast success is expressing genuine interest in her guest and letting them talk about themself. These two points make it so much easier in getting vital and relevant information to be shared with here visitors. I love all your posts, and this one was especially helpful since i’ve just started doing podcast interviews. I’ve always loved to interview people in my role as a recruiter, and now as a consultant who helps execs get a new job in the hidden job market, I’ve found wonderful people who share their expertise. Dang man, I wished I had read this article before doing my first interview. I think I talked for almost two minutes when I was introducing my guest and then I would just ellaborate on everything he said after answering my questions. It still has valuable info but man, it was a disaster. Anyway, thanks for the article, really helpful! Yaro. One of my biggest pet peeves is interviewers hijacking the interview. I hate it when the interviewer talks too much. In our studio, we’ve done over 272 expert interviews and I tried to train my interviewer to ask questions and be quiet. And for heavens sake, don’t make comments on people’s comments. Just ask the next question. Thanks for this great article. Excellent post and thank you for this. I am running one podcast real soon and these tips are very good for newbies like me! Just hit the Pocket for this and reading back from time to time. Thanks for that and subscribing to your newsletter as well! This is a great post! I think something that was touched on less was how important it is to get your technology and sound right. I do editing and consulting over at http://www.editaud.io for people who need some help in this space, or want to spend their time recording and talking (because that’s where their strengths are) and not with the editing. There’s nothing worse than not being able to get into the content of a podcast because of stutters or noise! It’s interesting that a lot of people use Skype/gotowebinar/etc instead of an audio program (like Audacity or Amadeus), the transition will improve the quality of the audio and make the editing process much easier! I loved that everyone was so genuine and placed emphasis on conversational and engaging podcasts. I love hearing the natural progression of a conversation, and its sometimes hilarious benefits =). Do you think it’s important to keep your audience in mind during these interviews? Interesting comments… I’m learning a lot from them! I totally want to be interviewed, but have no clue where to start. I haven’t done my first podcast yet, but your article answered all the questions I currently have. Thanks. Great article Yaro. Thanks for sharing. Q1). Should I use PC or Mac? Do u use the same tech? Q2). Where do I store the podcast? Q3). How do you prevent your website from running out of disk space with podcasts? 1. You can use either, but there are different software options for each.